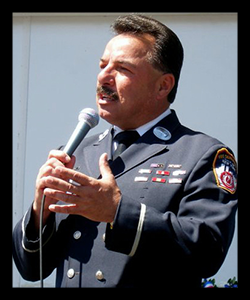 Joe Torrillo was a 25 year Lieutenant with the NYC Fire Dept. who is now retired on disability. He spent the first 15 years of his career in Engine Company # 10, across the street from the South Tower of the World Trade Center. While recuperating from a severe injury on New Year’s Eve of 1996 going in to 1997, Joe was assigned to convalesce in the office of fire safety education. Eight months in to this “light-duty” position, Joe was ultimately named the Director of this public-based program. In 2001, Joe worked on a project with Fisher-Price Toys to help design a new children’s action figure, part of their line of “Rescue Heroes”. In conjunction with the Executives of the Fisher-Price Corp., Joe chose the “Fire Zone” as the location for the press conference to introduce “Billy Blazes” and keeping with the safety theme, chose the date of September 11th, 2001. On the way to the press conference that was set for at 9am, Joe was about an eighth of a mile away from the World Trade Center, when American Airlines flight #11 struck the South Tower at 8:46 am. Fearing for his firefighter brothers in Engine Co. 10 and Ladder Co. 10 across the street from the towers, Joe diverted to the scene to render assistance. Unfortunately in the rescue operation, Joe was buried alive with a fractured skull, broken ribs, broken arm, crushed spine and heavy internal bleeding. Dr. Stephen James received his Doctor of Philosophy in Criminal Justice. He has researched police driving performance and has worked in WSU Spokane’s Simulated Hazardous Operational Tasks lab in the Sleep and Performance Research Center. He was the winner of the 2016 Outstanding Paper of the Year Award for Excellence from the journal Policing, for his paper on police drowsy driving. James’ research and that of his team has been featured on NBC’s Today Show and CNN, among other, more local outlets. 3) provide practical strategies to mitigate the effects of fatigue. UNBREAKABLE: “Flecti Non Frangi”, is a Latin phrase meaning “To be Bent not Broken”. It refers to one who can endure hardship yet still remain true to themselves. It’s about continual perseverance in each of our own lives stories. According to the dictionary, perseverance is one’s steady persistence in a course of action, a purpose, a state, especially in spite of difficulties, obstacles, or discouragement. Persevering is a combination of mindset and habit. Mechanically, it’s about having the stamina to actually keep going and doing the right things. Mentally, it’s about knowing where/how far to go while dealing with setbacks in the appropriate manner. 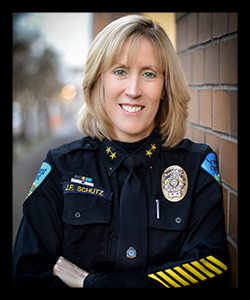 Chief Janie Schutz knows all about perseverance and the challenges one can face in their personal and professional life. She has met with nearly unsurmountable struggles in the ethical and moral arenas of life while facing some of the greatest challenges of our time in the police profession. From her time as a young female cop in a male dominated department, to her climb to Chief of a small town filled with racial tensions in North Carolina, and finally to challenges as an Oregon Chief where she was met with struggles of historical proportions, Chief Schutz candidly shares her story of personal and professional pride but also personal and professional pain. Join the Chief as she shares her path of passion, forgiveness, and redemption, all while loving and living the badge. Flecti Non Frangi. Bent but never broken. Paul LeSage worked for 29 years as a Firefighter/Paramedic, served on the Technical Rescue Team, and was the Lead Flight Paramedic at Life Flight for several years in Portland, Oregon. He retired as the Assistant Chief of Operations in January 2010, and has over 34 years of experience in emergency services as a provider and executive. He spent two years as the Interim Director at Washington County’s 911 Center, integrating a unique quality improvement, reliability and performance program. He is on faculty at OHSU as a Clinical Assistant Professor, and currently works as an Incident Investigator and Human Factors and System Analyst, primarily using probabilistic methods to deconstruct and analyze healthcare and aviation incidents. 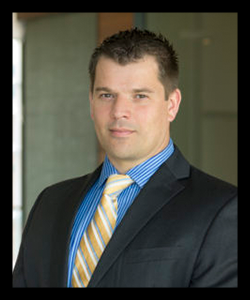 Paul works with companies such as SG-Collaborative Solutions and Critical Decision Partners, where he has provided event investigation and Just Culture integration in high-consequence domains across the United States and several foreign countries. He holds degrees in Organizational Communications, Human Factors, Emergency Medical Services, and Fire Science. 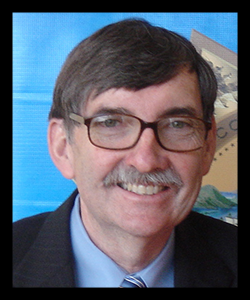 Paul also lectures nationally in the emerging fields of Just Culture, Crew Resource Management, and High Reliability Event Analysis and Strategies. Gordon Graham is a retired 33 year veteran of California Law Enforcement. During his tenure as a police professional, he was awarded his Teaching Credential from California State University, Long Beach. He was later graduated from University of Southern California with a Master’s Degree in Safety and Systems Management. Subsequent to this he was graduated from Western State University with a Juris Doctorate. 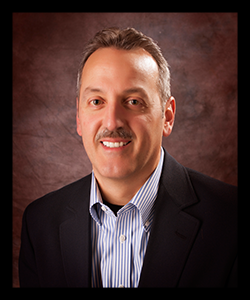 His education as a Risk Manager and experience as a practicing Attorney, coupled with his extensive background in law enforcement, have allowed him to rapidly become recognized as a leading professional speaker with multiple areas of expertise. Mr. Graham has taken this background as a street cop, supervisor and manager and coupled it with his formal education as a risk manager and his education and experiences as an attorney and is the Founder of Lexipol – a company designed to standardize policies, procedures and training within fire departments and law enforcement agencies around America. Cost of the seminar is $295 per person. Note: Last day for Cancellation is February 17, 2017. Registrations are transferable.